Just a quick message to wish everyone a fantastic Merry Christmas and Happy New Year. I will be taking the next two weeks off writing and will return early January 2009 for more Zambian Economist discussions. Oh...I know I have one or two comments to respond to, and shall ponder over them over the holidays. That of course includes any responses / comments left between now and then. The responses will surely come in 2009! Many thanks for all the fastastic exchanges we have had in 2008. It has truly been a rollcoaster ride! I wish everyone a safe and prosperous Xmas! Foreign mines ask Zambia for tax break - Minister (Reuters 21/12/08) - Foreign owners of Zambian copper mines have asked the government to cut fuel prices and mining taxes introduced this year to help them survive a commodities downturn, Mines Minister Maxwell Mwale said on Sunday. Mwale said the mine owners were pressing the government to reduce electricity tariffs, fuel prices and to cut some taxes, including a 25 percent windfall tax introduced in April. Faced with a sharp drop in international commodity prices, the mines need to cut operational costs to avoid further closures, after Luanshya Copper Mine (LCM) halted its operations on Saturday. Copper is Zambia's biggest export and mines are a major employer in the southern African country. Mwale and Labour Minister Austin Liato held crisis talks at the weekend with owners of some copper and cobalt mines. "They want reductions in electricity tariffs, taxes and also referred to removal of some levies on fuel," Mwale told Reuters. Zambia has some of the highest fuel prices in southern Africa at nearly $2 per litre while mining companies have complained of higher electricity tariffs. Mwale said the government wanted to keep mines operational but said more consultation was needed. As well as the 25 percent windfall tax, the government in April introduced a 15 percent variable profit tax on income above 8 percent of sales, raised mineral royalties to 3 percent from 0.6 percent and corporate tax to 30 percent from 25 percent. This prompted some mining firms to threaten litigation, saying the government had reneged on development agreements it signed with them to maintain lower taxes. The chief executive officer of the country's largest copper producer, the Konkola Copper Mines (KCM), said the mine would seek ways of reducing operational costs rather than cutting jobs. Konkola is majority owned by London-listed Vedanta Resources Plc . "We have made representations through the Chamber of Mines, especially in relation to duties (taxes) and mineral royalty," R. Kishore Kumar told privately owned Radio Phoenix. Kumar said the Konkola Deep Mining Project (KDMP), which is due to come on stream in 2010, was on schedule. The KDMP is due to start producing 150,000 tonnes of copper cathode per year and will together with other KCM new operations help raise the firm's total output to 500,000 tonnes from the current 200,000 tonnes, Kumar said. A big blow to the town of Luanshya. Luanshya Copper Mine (LCM) has halted operations and will only restart if the price of copper rises, the firm's chief executive officer Derek Webbstock comfirmed with Reuters. All mining operations ceased today and all 1,740 employees would be laid off. Clearly their cost cutting measure blogged here have not worked. Copper dipped below the 'psychological barrier' of $3000 earlier this week. LCM, is joint venture of International Mineral Resources and Bein Stein Group Resources, operates Chambishi Metals and the Baluba copper mine. Chambishi's cobalt smelter was shut down two weeks ago. But its roaster, which is used for copper refining, and the Baluba mine were still operational until today. Mweshi tagged me to provide a response on "why I blog about Africa". The short version : I suppose I blog about Africa because if we don't blog about Africa for ourselves, others would do it for us. 1. It is part of learning - life is about learning lessons. Blogging about Zambia allows me to be challenged by our many contributors. Often as an economist and citizen, one builds up "priors" or preconceived ideas. It is good to see those tested and refined so that my perspective on life continues to improve. It also gives me an opportunity to research areas I know nothing about. I like that the fact that with blogging, I can ask a question and know for certain that an answer will come from somewhere. 2. It is about influencing - I want to see Zambia become better than it is. There's no reason why after 44 years of independence many of our people live in abject poverty. I am frustrated that many times, the politics get in the way of intelligent and effective dialogue on life and death issues. Many Zambians just want to see things get done, regardless of the chitenge you wear. More importantly, many many Zambians have the solutions to make our nation better, but have no avenue for communicating their thoughts or debate them with other people. They simply wonder, why is it that something so simple cannot be fixed? or why has that never been tried? or where can I know more about X? This blog really is a small step towards offering a platform to ask and debate such questions. It exists to try and encourage positive dialogue on the many pressing challenges facing the nation. Its strength is drawn from the many contributors who sacrifice their time to understand the pressing issues and offer meaningful exchanges on many areas. 3. It is about sharing experiences - I suppose I could still do the above two things simply by sitting down and writing long papers and lobby government, from a closed room! But blogging allows me to interact with other Zambians (and non Zambians who care about Zambia) thinking about the same issues and share experiences. I believe there's much to be gained not just in reading what people write, but also understanding why people write the way they write. Its my goal therefore to ensure that at all times, Zambian Economist remains a friendly site. "During colonial times the whites found chiefs here and not politicians; even MPs are supposed to be under us because we are the owners of the land..."
Senior Headman Mtonga arguing that it is wrong for chiefs to be barred from politics, when it was "chiefs that brought independence". The question on the extent to which chiefs can be or are effective agents of political change will be discussed early in the new year as part of our blog specials on traditional authorities. A previous blog in the series Traditional Authorities - Part 1 : Chiefs in colonial Zambia has touched on the role of chiefs in the independence struggle. Whilst they didn't bring independence, they played a critical role in facilitating the struggle, especially through funding. ....Typically, a diamond mining company in Angola has to take on a large number of “associated Angolan personnel” at the exploration stage which bumps up its overhead costs and cuts down on the amount of funds available for the actual drilling and evaluation work. In the third and final edition of Breeze FM’s series (Previous parts : Part One - Independence Lost and Part Two - Struggle and Unity), it examines the events leading up to the day when colonial Northern Rhodesia became an independent Zambia. Zambians living abroad have learnt with a sense of shock and dismay that the government is in the process of changing passports and that holders of the old documents should change them by April next year. Much as there is need for the change of old passports to new ones with enhanced security features, the suddenness with which the process is being conducted is illogical, to say the least. The changes with the concomitant costs should apply to new applicants and those whose passports are expiring rather than a blanket call for everyone to change the documents. The Zambian authorities should understand the cost involved in changing passports for individuals and families and also the cost of obtaining visas in foreign countries and the general inconvenience of the process. This is not to mention the fact that some passport holders hold documents that were issued as recently as three months ago from the old batch. This change of passports being foisted on the citizens could cost Zambians living in the UK up to £2,000 applying for new visas within a short time and in these days of the credit crunch, this is not a small amount. Even then, the process of applying a passport both at home in Zambia and abroad can be stressful. Passports take ages to be sent to embassies and high commissions from where they are applied for and staff at these missions always blame the Passport Office in Lusaka for the delays. One hopes that the new Home Affairs Minister, Dr Kalombo Mwansa will look into the concerns and change the modus operandi of the passport renewal exercise. I would add though that this passport saga illustrates why more than ever the diaspora should recognise the need to organise themselves. The only reason GRZ is able to come up with such ridiculous plans and timescales is precisely because the diaspora lacks a voice - they suffer from "coordination failures". Which is why I am excited by this initiative we are working on. It should allow Zambians in the future a channel to engage GRZ on a range of policy issues, including those that affect them directly. ZCID makes a suggestion (ZNBC News, 19/12/08) : The Zambia Centre for Inter party Dialogue has proposed that Zambian's living abroad should be given an opportunity to vote during elections. Centre spokesperson, Langtone Sichone, says this will give Zambians in diaspora an opportunity to chose their prefered leaders. He says there is need for the National Constitutional Conference, sitting in Lusaka, to seriously look at the proposal. Mr. Sichone was speaking during a live National Constitutional Conference programme on ZNBC television. Mr Sata said in Lusaka yesterday during a Press briefing that the Government should continue finding ways of reducing expenditure to mitigate the effects of the current global financial crisis. As one of the options, he said, the Government should start trimming down the number of ministers, deputy ministers and permanent secretaries as a measure to reduce the cost of Government operations. He urged President Banda to consider reducing his Cabinet to cut on expenditure. Mr Sata said that what the Government should be doing now was to find solutions to problems facing the country and stop blaming everything on external factors like the financial crisis. He called on the media to be proactive and fight for the majority of Zambians threatened by poverty. “I am urging President Banda to start reducing the number of ministers, deputy ministers and permanent secretaries in ministries where there are two people doing one job,” he said. On the National Constitutional Conference (NCC), Mr Sata maintained that it should be suspended. He said Government could still save some money from the NCC if it focused on thorny issues in the Constitution and made necessary amendments like what his party did in 2005 when it presented a proposed bill to Parliament on the 50 per cent-plus one vote. Manifesto for Economic Transformation in which MrK proposes a restructuring of government to about 12 ministries. Cabinet Size - Mulongoti Versus Everyone? which discusses issues related to "tribal balancing" and whether the current government is bloated. A memo to President Banda provided early advice to the new president to build a much leaner government focused on the essentials and not just create posts to reward those that helped you get elected. As a footnote, another interesting post is Optimal size of Government? where I argue that the Mung'omba Draft Constitution appears to tie a sitting government to the number of cabinet posts. A recipe for disaster if adopted. Zambia may open mission - RB (ZNBC News, 19/12/08) : President Rupiah Banda says government is considering opening a diplomatic mission in Cuba. Mr.Banda says Zambia stands to benefit a lot from Cuba once representation is established in that country. He said this when he received credentials from Cuba's new Ambassador to Zambia, Carmelina Rodriguez, at State House in Lusaka on Friday. President Banda paid tribute to the Cuban government for its support to Zambia in various sectors. And Ambassador Rodriguez pledged to strengthen the already warm relations between Zambia and Cuba. She also thanked the Zambian government for speaking against the American blockade on Cuba. We have previously discussed housing accommodation as constraint to rural education (see Constraints on rural education (teacher accommodation) ). The GRZ appears to be taking some steps with the latest promise of Education Minister, Prof Lungwangwa that "the Government would next year construct 27,800 housing units for teachers with a view to addressing accommodation challenges that the teaching fraternity was facing". Minister appeals to Zambians (ZNBC News, 18 December 2008) : Tourism Minister, Catherine Namugala, has urged Zambians living abroad to help the government market the country's tourism potential. Ms. Namugala says Zambians in the diaspora can be excellent agents of marketing the country. The Minister says much of the world is still ignorant about the geographical position of Zambia and its profile. This is according to a statement released to ZNBC news in Lusaka by Public Relations Officer in the Ministry of Tourism, Bwalya Nondo. The Minister said while Zambian Missions abroad are doing their part to market the country, zambians abroad can also help to sell the country. "The Zambian people will not listen to excuses of global this, global that because such problems will always be there and the only countries that will cope are those with serious, intelligent and hardworking leadership". An interesting two part series from Ryan Gunderson at the Next Billion, on his recent travel to Zambia. I came across this interesting paper Fiscal Decentralization in Kenya: The Constituency Development Fund (CDF) and the Growth of Government. Although the methodology raised a few questions, I was atleast happy to see that some analysis is being done on CDFs. Zambia has had its own CDF since 1995. Under this initiative, the government allocates development funds on an annual basis to all constituencies under the control of the local MP. The 2008 CDF fund is K50bn though only K46bn appears to have been delivered because of the failure by some constituencies to do the job properly in 2007. Each constituency gets K400m, with increasing calls for this to be raised significantly. Infact Rupiah Banda when campaigning for the Presidency promised to raise it to K1bn. History also records that HH promised to increase it to K4bn. RB is the President, I wonder whether the new Budget will see this fund raised. The logical inference is that CDF is good. Well, atleast policians believe it is vote winner! The idea behind the CDF is to empower local communities by providing a pot of funding for health, education and other initiatives. Some great projects have actually been accomplished through it. In practice, it is more of a political tool to reward those areas that voted for you. Not surprising therefore that the CDF budgetfor this year (referenced above) was released on the 7th October 2008, in good time for the 30th October elections! Then comes the corruption cases (see here and here), poor financial management (see the comments from the recent Parliamentary Committee Report on Local Governance, Housing and Chiefs' Affairs . The news article on the same here ) and bizarre projects. Indeed the former Local Government Minister Silvia Masebo, when she was in charge, appeared to conceed that the CDF has been abused. The fingers of accusation are never too far away among officials. The role of chiefs also remains unclear. In December last year the GRZ was calling for chiefs to utilise these funds. Not sure how that works when the fund is controlled by the MPs. For their part, chiefs have been calling for the CDF to be properly monitored. Some of course, never bother to use the funds. Some just want the all thing to be abolished. But here is the thing. How the CDF is handled signals something about the quality of the MP in the area. I just wonder whether GRZ can do more to ensure people are more aware of this. Consider the previous post - Exposing corrupt politicians....lessons from Brazil . Assuming that the CDF is here to stay. Update 1 : more on the debate in Kenya : Poverty Statistics versus CDF: Which Way for Kenya ? Update 2: It appears that RB will indeed increase the CDF to K1bn next year. This article quotes the new Local Government Minister Tetamashimba saying, "Our projection is that let us have K1 billion next year because we want this Government to continue after 2011". The reference to 2011 clearly suggests that GRZ sees this as a critical way to empower local communities. We continue our series on "alternative perspectives on Zimbabwe", with the latest offering from Mahmood Mamdani the author of the brilliant Citizen and Subject (but not without flaws). Previous "alternative perspectives" articles can be found here and here. New research by Putterman and Weil based on a new large dataset of the world's 165 largest countries suggests that inequalities within countries is explained by the past histories of populations more than by ethno-linguistic differences and linguistic distance. In other words, it appears to suggest the impact of history on GDP flows through families, not nations. What matters is the history of the people who live in a country today, more than the history of the country itself. In our last Vox column, we described a new data set that allows us to identify what proportion of the ancestors of people who live today in the world’s 165 largest countries lived within the current borders of those same present-day countries in the year 1500. A key finding from our research with the migration matrix concerns persistence in income differences. We find that the long historical persistence of capacity for generating or capturing income is considerably stronger than has been suggested by earlier studies – studies that made cruder corrections for the great population movements of the past half-millennium (or no correction at all). In this, our findings are in line with other studies that find centuries-long persistence in the impact of other growth determinants. Studies by Bockstette, Chanda and Putterman (2002), Hibbs and Olsson (2004) and Comin, Easterly and Gong (2007) indicate that the long-standing presence of state-level polities, the early advent of agriculture, and early advancement with respect to technologies ranging from writing to metallurgy, can explain an appreciable part of today’s global variation in country incomes. We find similar results for state history and agricultural onset variables in our large cross-country sample, but with an important difference. We show that the impacts of these variables on today’s incomes are twice as large when correcting for the origin of nations’ current populations. That is, when we use the weighted average values of the countries of origin of today’s country populations instead of unadjusted country values. Our country-origin adjustment also allows us to explain three times more of the variance of country income than is possible with unadjusted figures. In other words, it seems that the impact of history on GDP flows through families, not nations. What matters is the history of the people who live in a country today, more than the history of the country itself. More precisely, state history and year of agricultural transition explain under 10% of the variance in today’s country incomes; corrected for post-Columbian population shifts, either variable can explain about a quarter of that variance. Accounting for population origins in those countries having large non-indigenous population shares, like the countries of the Americas, Oceania, Taiwan and Singapore, provides a substantially more accurate window into the persistence of past advantages. If past history of populations has this much power to explain current country incomes, can it also help to explain the incomes of population sub-groups within countries? Do the different histories of people of African, Asian and European ancestry in the US, those of Indian and Polynesian ancestry in Fiji, or those of Chinese and Malayan ancestry in Singapore, help to explain socio-economic stratification within those countries? We explored the issue using both cross-country regression techniques and individual country case studies. In our regression analysis, we calculated for each country the weighted average standard deviation (among its subgroups of different country origin) of both our state history indicator and our years since agricultural transition variable, and we entered each of these variables in a separate regression, along with the log of current income, to predict current within-country income inequality as measured by the Gini coefficient. Both standard deviation measures turn out to be highly significant predictors of the Gini, accounting (along with log of income) for about a third of inequality’s cross-country variation. In contrast, a conventional ethnic fractionalisation measure, due to Alesina et al. (2003), explains (also along with income) only 12% of the variance of countries’ inequality levels. We also tried using the cultural diversity measure of Fearon (2003), which is based on estimates of “linguistic distance” (roughly, degrees of separation on a tree representing the evolution of the world’s spoken languages), in some regressions. That measure turned out to explain (along with income) less than 10% of the cross-country variation in income inequality, compared to the 31% explained by the standard deviation of state history. Perhaps the Alesina et al. and Fearon measures explain less of the variation in within-country inequality because the factors they account for are inherently less relevant to groups’ income levels than are the early development histories of populations’ ancestors. To give their measures a fair trial, we decided to explore how much they too might be improved by accounting for post-1500 migration. We created a counterpart to Alesina et al.’s ethnic fractionalisation variable that measures the degree of fractionalisation among the ancestors of each country’s current population, rather than among countries’ current ethno-linguistic groups. The two sets of measures differ in their treatment of groups such as the mestizos or mulattos of Central and South America or Cape Verde. Such groups are treated as ethnically homogeneous by measures like Alesina et al.’s, but as having ethnically heterogeneous ancestry, in our counterpart measure. We did the same with Fearon’s cultural diversity measure, creating an indicator that looks at the linguistic distances between people’s ancestors rather than their linguistic distances today. Our new measure, for instance, accounts for the very large linguistic distance between the Spanish and the Amerindian ancestors of a typical Spanish-speaking Mexican of today and for the smaller linguistic distance between the Spanish and the Italian ancestors of a typical Spanish-speaking Argentine of today, rather than treating such Mexicans and Argentines as being of zero linguistic distance since they now all speak Spanish. When we substituted the ancestry-amended counterparts of the Alesina et al. and Fearon measures for the originals, we found that the new variables are far more statistically significant predictors of inequality. The substitutions double or more than double the regressions’ explained variances. It seems remarkable and somewhat surprising that to bear in mind that Mexicans (to use that example one last time) have both Spanish and Amerindian ancestors even if those once separate lineages have long ago inter-mixed, doubles our ability to predict their country’s level of income inequality today. These last two “successes” for the migration matrix do nothing to diminish the importance of our early development indicators, however. We added the standard deviation of state history back into the inequality regressions that include the original and the modified Alesina et al. and Fearon measures. The state history variable remained highly significant, whereas even the modified Alesina et al. and Fearon measures were no longer significant predictors of countries’ inequality levels once standard deviation of state history was included. Thus, the degree of difference in levels of early development as proxied by state history dominates both ethno-linguistic difference and linguistic distance as a predictor of inequality. A natural explanation of the link between variation of early state history and inequality of income would be that descendants of people with high scores for early development such as Chinese and Italians tend to have higher incomes in whatever countries they are found in than do descendants of people with lower scores for early development such as Kikuyus and Polynesians. The bigger are the differences in early development, the bigger are the differences in incomes. But is there any direct evidence of this at the within-country level? We decided to investigate by searching for information on the identities, origins, and incomes of the main ethnic groups in the ten countries in our sample in which the weighted average standard deviation of state history is highest. We also looked at the US, an ethnically diverse country for which relatively good data exists, which ranks sixteenth in the sample. Once again, our findings support the presence of remarkable persistence of early advantages within human groups. countries considered, the socio-economic ordering of groups perfectly dovetails with that of their average state history values, and in the other two countries, the broad pattern is also consistent but with small exceptions (such as higher income for US Asians than Whites despite a slightly lower average state history for the former). A troubling aspect of the case studies is that slavery, indentured servitude, colonial regimes, and legal discrimination played large parts in shaping economic stratification in almost every country looked at. persistence of economic success for populations as they existed in 1500, and that this persistence is no less evident at the sub-national than at the national level. Alesina, Alberto, Arnaud Devleeschauwer, William Easterly, Sergio Kurlat, and Romain Wacziarg, 2003. "Fractionalization," Journal of Economic Growth, vol. 8(2), pages 155-94, June. Bockstette, Valerie, Areendam Chanda and Louis Putterman (2002). “States and Markets: The Advantage of an Early Start,” Journal of Economic Growth 7: 347-69. Comin, Diego, William Easterly, and Erick Gong, “Was the Wealth of Nations determined in 1000 BC?” mimeo, 2006. Fearon, James, D., “Ethnic Structure and Cultural Diversity by Country,” Journal of Economic Growth, 8:2, June 2003, 195-222. Hibbs, Douglas A., and Ola Olsson, 2004, “Geography, biogeography, and why some countries are rich and others are poor,” Proceedings of the National Academy of Sciences 101: 3715-3720. Putterman, Louis and David N. Weil, 2008, “Post-1500 Population Flows and the Long Run Determinants of Economic Growth and Inequality,” NBER Working Paper 14448. BlogTalkRadio had an interesting discussion this weekend on unplanned settlements in Zambia. The medium is becoming very popular as a way for Zambians at home and abroad to share views. This particular programme raised some interesting issues on "city planning". One issue which was unfortunately not discussed was the challenges of "isolated settlements", an issue that is critical in the context of national development planning. The Angolan President is not standing still while oil prices fall around him. Yesterday, President Jose Eduardo dos Santos (facing an early next year) went to China to seek new loans, in a bid to stabilise Angola's massive expenditure spending on infrastructure. The country may seek around $1 billion for infrastructure and homes for the poor over the next four years. Angola's 2009 programme was estimated at a staggering $42bn before the current fall in oil prices (government calculated the budget based on an oil price of $55 per barrel). The mysterious world of Zambian MFEZs continues. I must have missed the annoucement that Lumwana is now a MFEZ. This article notes that the"establishment of a MFEZ at Lumwana Mine in North-Western Province was progressing well". I had read that Solwezi was declared an MFEZ. Lumwana , Solwezi....same thing, no? Well, no because according to Mr Mutati all that remains is the "need for Lumwana Mining Company to apply formally to the Government for incentives". If I was cynic, I would say these MFEZs are now beginning to sound like a ploy for the mining companies to simply avoid taxes (especially at this critical time for them). Perhaps now is the time to ask : Is it the GRZ's policy to turn all of Zambia into an MFEZ? Is "export led growth" overrated? The Mines Minister has revealed to Reuters that the nation's largest cobalt producer Chambishi Metals Plc has stopped production of the metal because lower prices mean it is not viable. The government is apparently "assessing options to ensure that Chambishi's troubled owner, Luanshya Copper Mine (LCM), does not shut its copper operations as well, and added it was trying to attract fresh investment to rescue the company". These are troubled times indeed. The new route between Luanda and Beijing, we blogged here, finally took off this weekend. The flight will run twice a week on a TAAG's Boeing 777-200 ER. Maureen Mwanawasa. In 2008 she emerged as a serious contender to replace her husband, and with the MBA in her sights, she is clearly not planning to be a local administrator. She has the experience, the name and public following to probably emerge as a strong player in Zambian politics 2011 and beyond. A joint award : Sakwiba Sikota and Edith Nawakwi. Having backed Rupiah Banda in the election and hoping for a ministerial job, the President in the end spurned them, and with that they are left without credibility and without parties. Any moment from the Presidential bye-election. Too many to mention, but Michael Sata's arrival at the nomination on a boat must rank as one of the most memorable electoral images of recent times. The shuttling of President Mwanawasa's body across the country. That must surely rank as the lowest form of politics this year. It was bad enough that the updates appeared to have been engineered, but to take the body around the country for what clearly looked like early campaigning was most disgraceful indeed. The many towns in our country going without food. In many of our areas, many people have turned to wild fruits, and this story only gets five lines on ZNBC News. Nearly all the news and blogs have not focused on the quiet enemy ravaging our people, even as food prices rocket. Too many to mention, but the one story I always find puzzling is FTJ's medical reviews. The newspapers are always reporting FTJ's trips to South Africa. Sometime, they even send reporters to RSA to keep watch. It surely displays the idiocy of what passes for "political reporting" in our local media. The National Constitution Conference. At $350 per day per delegate, with an endless timetable, it is the most irresponsible use of tax payers money. How Zambians can tolerate this process is beyond me. Sitting on the NCC should be an exercise in patriotism not greed. Increasing fertiliser support was definitely a good move. Yes it was done as a "political gimmick" and out of the budget cycle, but it was long overdue. My hope is that in 2009 we will see more focus on agriculture, and perhaps on the infrastructure to support agriculture. The MMD decision to go with Rupiah Banda was the boldest political tactic this year. Although RB was the Acting President, it was clear to many people that he was relatively unpopular and unrecognisable. However, when he was chosen it soon became clear that by virtue of his candidacy certain provinces where now "guaranteed". A gamble well played. The decision to reform ZAMTEL - in the end common sense prevailed and the government now appears to have seen some light. We now look forward to a full and frank consultation on how ZAMTEL should be reformed. This cannot be a decision for the Cabinet alone. Sakwiba Sikota et al early attempts to argue that the bye-election was not necessary. They even brought on board a couple of failed politicians to argue their case. Such blantant and disgraceful attempt to railroad our constitution was wonderfully rejected and people in the end had their say. Ng'andu Magande. Yes, he made one or two political miscalculations that ultimately cost him his job. But may be, just may be, the real losers are the Zambian people who have been robbed of his expertise at this trying time. The "new fiscal regime". This was billed as the government taking back from the mines what belongs to the Zambian people. Unfortunately, the truth has been far from the spin. The IMF was the first to lean on the government to backdown on some elements. After that it was free for all for the mines. Up to now very few mines have paid their tax obligations under the new regime. Some have even gone further to call for new lower taxes, given the falling copper prices. I am not holding my breath for the next budget. Its fair to say the fiscal regime died a very premature death. Justice Mumba, the ECZ Chair. About the only reason many people believe this year's election were free and fair. She tried her very honest best to do the most difficult job and must be applauded. Chiefs. This year was the year in which Chiefs were found to be of little substance. Many crossed the "uncrossed line" and put forward significant endorsements for their preferred candidate, but in the end it did little to change the electoral maths. The biggest losers were the southern Chiefs who disgracefully backed Rupiah Banda in search of money - well atleast one or two had the honesty to admit it. History records that HH was triumphant in Southern Province. Robert Mugabe - we all thought he was finally finished, atleast the international media had us believe that he was gone. Well, as he constantly reminds, he is not going anywhere. JCTR : the JCTR continue to provide insight and holding government to account without the fireworks. Their food basket data and push for a framework on debt really shows the kind of intellectual leadership Zambia is longing for. FSRP : the fantastic folks at FSRP continue to churn out insightful papers on agriculture issues. I am always looking forward to reading their analysis and this year, we have such fantastic papers from them - from the analysis of the cassava industry to options for securing food security. The list has been endless, and long may it continue. Silvia Masebo. Yes she lost her job at the Ministry of Local Government and Housing, but I have always considered her a very effective Minister. Okay, I had one or two jibes at her for threatening to disband chiefdoms, but in general her tenure was very bi-partisan and had good command of details. ZESCO. For being such a shambles. This is a company that does nothing for the average Zambian, while its executives are on hefty pay. Aside from continous loadshedding, ZESCO and the ERB (the regulator who acts as a partner in crime) do nothing to reflect the reduced service quality in their bills. They expect you to pay despite the poor quality. No compensation, No nothing. The Pf will indeed hold a conference in 2009 to elect new leaders....that will unite the party and give them a common purpose. I make a bold prediction of Ng'andu Magande leaving the MMD, alongside other notable players and starting their own party of "reformists". I predict that UPND will largely disintegrate in 2009, and may well be subsumed by the "new reformist" party or the other two. I promise to complete the blog specials on "Traditional Authorities" !!! When I started it, I thought it was going to be a breeze, but as I have read around and dug into into, the task has become daunting! But I am not giving up.....its only four more long posts to go on it!! The Zambian people - the Zambian people once again showed that One Zambia, One Nation spirit at the moment challenging time of our history. We united and mourned our President in peace, and held by most accounts, very peaceful and fair elections. A joint prize : Godfrey Miyanda and Thabo Mbeki. The former for achieving the impossible of getting less votes than "void" ballots. The latter for a humiliating exit from the powerful seat in Africa. Rupiah Banda - the man came from nowhere and snatched the MMD crown, leaving in his trail a broken Mwanawasa dynasty, denying Magande a shot at the Presidency and forcing Pf back to the drawing board. Another joint prize between Mulongoti and Mugabe. The latter continues to hold onto to power at all costs, the former for uttering some of the most bizarre statements we have heard from a Zambian politician for a very long time, including his promise to ban the Post, if RB was elected. Undoubtedly, the death of His Excellency President Levy Mwanawasa . The Zimbabwe dialogue between ZANU-Pf and MDC factions. We started off with the elections, that did not work so negotiations begun, that has not worked either. The whole situation I am afraid to say is now just unfortunately boring to most observers. Many now have grown tired of Zimbabwe and wish the people of Zimbabwe can do more to make Mugabe see sense. The foolish attacks at the Post newspaper. I once came across a poorly written article called "gatekeepers now turned poachers". So poor that I never blogged it. In it the author purports that the Post lost its social direction. But what the author missed is that the Post is "privately owned". It holds no formal obligation to the Zambian society. If you don't like the Post start your own paper, and while you at it, send a note to GRZ to complain the poverty of ideas that govern the Daily and Times. Michael Sata's continous insightful challenges on the failure of the NCC process. From the beginning, he argued that the process was flawed and was likely to see significant cost overruns. The incentives were always pointing to prolonged and inefficient dialogues. As of December 2008, the NCC have nothing to show for it, not even a website! To make matters worse, they now want a costly extension to their proceedings. Vernon Mwanga - and we thought the man had disappeared from Zambian politics, only to make his way back. Owners of Lusaka Times - legend has it that Lusaka Times came on board and killed all the websites that existed where Zambians congregated for political discussions, and now the main websites like the Post, Times and Daily Mail appear to be under threat. Its website has two key features that these others don't have - "interaction" and "RSS"!! Hakainde Hichilema - when is he going to get it? He'll never be President of Zambia. Its time for UPND to recognise that Zambia has no political space for more than two parties. HH's arrogance cost the opposition a serious short at Plot 1. Its gotta be Rupiah Banda caught practising food based corruption. The government latter tried to offer explanations, which only made things worse. The National Constitution Conference. Zambians have had enough. Enough of the talking with no results and enough waste of money! While many of our people live on less than $1 a day, NCC delegates are being payed a staggering $350 per day . Two lies, I am afraid, all linked to LPM. The first was the updates we appeared to receive of his condition. I am confident that history will judge those updates as not genuine. No one really knows how those updates came about, and who released them. The second relates to the mystery "LPM chosen successor". When the President's Will was read on television, we found out that not only was it old, but had nothing in it to suggest that LPM had someone in mind. Barack Hussein Obama or as Fox News calls him BHO. Zambia Development Agency CEO Andrew Chipwende exhibiting a very poor understanding of competition issues. It is true ZAMTEL is not a statutory monopoly because the gateway is liberalised. The point is that the higher cost of entry into the international gateway, coupled with the political stance preventing emergency of alternative gateways [a quasi planning restraint - even if you can pay the IGW license fee, government is unwilling to give you the license] prevents other players from emerging in the international segment market. This makes ZAMTEL a de-facto monopoly. As for who "controls" the IGW, Chipwendo would do well to familiarise himself with previous submissions from the Zambia Competition Commission (ZCC) e.g. the 2003 submission to the Select Committee on Transport and Communication : "the position of Zamtel means that it has the power to prevent, restrict or distort competitor access to this essential infrastructure [IGW] which was built with public funds". ZNBC News reported earlier in the week that "Government has put in place sufficient measures to mitigate the impact of the global financial crisis". In line with the IMF recommendations, the government will "deliberately focus on under-pinning infrastructure investment in all sectors of the economy". Nothing wrong with focusing on infrastructure investment. What i found most baffling was the revelation "that government has secured credit facility agreements with multi-lateral financial institutions as a way to cushion the impact of the global financial hiccup". If the government's policy is to drive Zambia into deeper external indebtedness that policy should be transparent. As I noted in the blog Zambia's rising external debt.. the absence of national framework on debt is worrying, especially now that government is signalling greater external borrowing. Step 1: Segment the present Zamtel corporation into two separate entities, one encompassing domestic telecom delivery and customer service (Zamtel-Dom), the other managing the international gateway and related long distance infrastructure (Zamtel-Int). Restructuring of Zamtel-Dom and Zamtel-Int can then be treated as separate challenges, and unique solutions devised for each. The aim of this proposed model is to provide a solution for Zamtel-Int primarily, with provisions imposed on Zamtel-Dom solely for purposes of compatibility with Ztel-Int in its new form, and identical to impositions on other domestic market participants. Step 2: Determine an appropriate base-tariff rate to be charged to domestic corporations by Zamtel-Int for access to a certain amount of transmission capacity or bandwidth, whatever standard metric is agreeable to regulators and sector participants, which are herein referred to as "slots" solely for convenience. The tariff should be sufficient to sustain normal operations, as well as a reasonable margin for error or profit, but not both. Step 3: Determine an appropriate minimum base-rate for investment in new or improved international gateway and related long distance infrastructure, to be collected from domestic telecoms at the same time as the tariff for each slot they obtain. Domestic telecoms will then presumably pass this cost on to customers in the form of user fees on long distance calls made. These investment tariffs will be deposited and managed in an Increased Capacity Investment Fund (ICIF) until such time as Zamtel-Int, in conjunction with regulators, determines that the accumulated amount is sufficient to undertake a project to increase long distance telecom capacity. Step 4: Divide nominal ownership of (but not operational or policy control over) increased capacity, or "new slots", between Zamtel-Int and domestic telecoms 50-50%, with any amount determined by regulators to have been expended on avoidable or unreasonable cost overruns or other mismanagement deducted from the Zamtel-Int share only. New slots would then be allocated to domestic telecoms in direct proportion to their relative contributions to the ICIF expenditures on the project. Step 5: Going forward, slots which are owned by domestic telecoms would be made available to them on a single-bidder, non-transferable basis, at the base-tariff and base-investment tariff rate. Should they be unwilling or unable to make use of their slots temporarily, they would revert to the general Zamtel-Int pool of slots available for auction. All slots in Zamtel-Int control would be auctioned off to the highest bidder(s), with any excess above the base-tariff being deposited in the ICIF, and credited to the domestic telecom and Zam-Int at the standard 50-50% split. Villagers run out of food (ZNBC News, 12/12/2008) : Villagers in Chief Chipepo's area of Gwembe District are reportedly surviving on poisonous wild tubers because of a critical food shortage in their area. And Government has described the hunger situation in Gwembe district as serious. Acting District Commissioner, Mathias Fundi, says his office had made a formal request for relief food through the Southern Province Disaster Management Unit. According to ZANIS, the villagers are eating seeds locally known as sozwe which are said to be poisonous if not properly prepared. According to the villagers sozwe seeds are supposed to be cooked for three days before they are ready for consumption. Albidon Limited has announded that 110 of its 260 workforce have been sacked at its Munali nickel mine in Southern Zambia after prices for the steel making metal slumped. A statement to the Australian Stock Exchange said the exploration office in Cape Town and Lusaka are closed. The Statement said the Perth office is relocating to shared premises and that most exploration projects have been suspended. 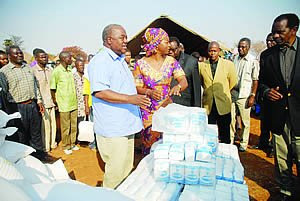 An International Monetary Fund (IMF) mission visited Zambia during December 2-10, 2008, to continue discussions for the first review of the Poverty Reduction and Growth Facility (PRGF) arrangement that was approved in June 2008. The mission met with Minister of Finance and National Planning, Hon. Situmbeko Musokotwane, Bank of Zambia Governor Caleb Fundanga, and other senior officials, as well as with representatives of the business community, civil society, and Zambia's cooperating partners. "The Zambian economy has grown strongly in recent years owing to highly favorable external circumstances and significant progress toward macroeconomic stability. In 2008, the external environment has become progressively more difficult. Rising world food and fuel prices early in the year pushed inflation up steeply. More recently, the sharp fall in copper prices, in the wake of the global financial crisis and slowing world growth, has adversely affected export proceeds, the profitability of the mines, and government revenue from the mining sector. The slump in copper prices will inevitably have a detrimental effect on Zambia's economic prospects in view of the mining sector's central role in the economy. "In these circumstances, it is essential to calibrate macroeconomic policies carefully. A loosening of fiscal and monetary policies aimed at supporting economic activity needs to be balanced against the risks for macroeconomic stability over the medium term. Moreover, fiscal policy should be guided by the need to create the fiscal space necessary to increase spending on infrastructure so as to encourage diversification of the economy. Monetary policy should continue to be oriented toward bringing inflation firmly down to single digits over the medium term. "While the fiscal policy stance has generally been prudent in recent years, budget execution has exhibited weaknesses. In particular, the pattern of spending has deviated significantly from what has been budgeted, notably in regard to capital spending. The authorities are committed to managing and using its available resources more effectively in order to sustain growth and poverty reduction. most effective use of available resources and enhance the competitiveness of the Zambian economy. "Notwithstanding the narrower fiscal space than had been anticipated only a few months ago, infrastructure investment remains key to enhancing Zambia's competitiveness and growth prospects. Transportation and electricity generation and transmission stand out as sectors in need of increased investment. Measures to stimulate private sector investment in infrastructure need to be strengthened. In this respect, recent steps to establish a framework for public private partnerships is encouraging. "The IMF stands ready to assist Zambia in these challenging times. The authorities and the mission reached an understanding on the macroeconomic framework for 2009 and anticipates returning to Lusaka soon after the presentation of the 2009 budget to finalize discussions on a complementary structural measures." This year’s Global Economic Prospects finds the global economy at a crossroads, transitioning from a sustained period of very strong developing country–led growth to one of substantial uncertainty as a financial crisis rooted in high-income countries has shaken financial markets worldwide. Commodity markets too are at a crossroads with the very high prices of 2007 and early 2008 having fallen by more than half in many instances. Great uncertainty surrounds the implications of this crisis for developing countries. Initially, the repercussions for developing countries of the financial turmoil that characterized 2007 and the first half of 2008 were limited. However, since September 2008, the intensification of the banking crisis, the collapse of several global financial players, and the sharp increase in emerging market bond spreads have dramatically altered the outlook for developing countries. These events constitute the kind of disorderly adjustment that has been discussed in previous reports as a risk. Materialized, it implies a sharp slowdown for developing countries and the possibility that serious crises may emerge. While the measure of that slowdown and its near-term implications for growth and incomes are important, governments in developing countries also need to be mindful of the longerterm implications of their policy response. Thus, while countercyclical policy may help reduce the short-term costs of the slowdown, care must be exercised to react prudently so as not to endanger longer-term fiscal sustainability and growth prospects. For as serious as the coming slowdown may be, developing-country growth is expected to recover after the crisis is over. Commodity markets have seen spectacular swings over the past 24 months as enormous tensions first built up and were then released. The extended and sharp rise in commodity prices prompted concerns that the world was transitioning into a new phase of commodity scarcity—a concern that the recent dramatic drop in commodity prices has only partially alleviated. Long-term supply and demand prospects for commodities suggest that while commodity prices are likely to be higher than they were during the 1990s and early 2000s (when they were depressed by excess supply), the recent peaks that have been observed are unlikely to be the new norms. Over the long run, demand for commodities is not expected to outstrip supply. Even though per capita incomes in developing countries are expected to continue rising rapidly, population growth is slowing and with it global GDP growth. As a result, the pace at which commodity demand expands should also ease. Assuming that efficiency with which commodities are both employed and produced continues to improve as it has done over the past few decades, supply should keep pace with demand. However, policy will need to be supportive if such a positive result is to materialize. In particular, agricultural yields have declined in recent years. Unless governments in developing countries and aid agencies take concrete steps to increase investment in rural infrastructure, agricultural research and development, and agricultural extension services, it is possible that global agricultural productivity growth will slow. Higher food prices would follow and many countries that are now self sufficient in food (notably those that still have fast growing populations) would become large net importers of food. On the energy side, policies to combat carbon emissions would help slow the depletion of hydrocarbon resources, by speeding both demand-side and supply-side substitution toward cleaner energy sources. If successful in slowing global warming, these could also help prevent the very large agricultural productivity losses predicted by some in the second half of this century. The recent boom in commodity prices has challenged policy makers in both producing and consuming countries. Encouragingly, commodity producers appear to have managed their windfall revenues more prudently than in the past. Instead of expanding spending programs in line with increased revenues, many have saved a much larger share of these revenues—reducing the likelihood that they will need to cut back spending in a procyclical manner now that commodity prices (and global growth) have declined. However, countries with new-found commodity wealth or newly independent commodity-rich states have not shown similar restraint and may encounter more difficulties during the current downturn. Reading through the report, its very much as we expected. However, I couldn't help but think that perhaps other developing nations are better positioned than we are to withstand the coming storm, given the "windfall gains" they appear to have captured whether from oil or higher metal prices, their relative superior fiscal discipline, focus on infrastructure spend, and the extent to which some have moved rapidly to ensure they do not become net importers of food. I truly hope its just my unfounded worries! The World Bank launched last week its annual flagship report on Africa, the Africa Development Indicators. The report presents data from 1965 to 2006 for 53 African countries and 5 regional country groups, arranged in separate tables or matrices for more than 450 indicators of development (including the infrastructure development indicators partially discussed on Infrastructure challenges, revist'd..). It also includes an essay on a specific topic of current interest for Africa : Youth and Employment in Africa – The Potential, the Problem, the Promise. You can access on-line and download the full report as well as its pocket version, the little data book on Africa. “Zambia needs to diversify the production and consumption of its food crop away from heavy dependence on maize if it has to attain food security and we call upon the recently constituted taskforce to critically examine this issue,” says Miniva Chibuye, Coordinator of the Social Conditions Programme of the JCTR. In pursuing the strategy of food crop diversification, Zambia should draw from the experiences of other African countries. But even within the country, there are pockets of experiences that can inform the process in a very meaningful way. Moreover, this strategy is not outside Zambia’s development strategy. For example, the Fifth National Development Plan explicitly mentions that “food crops such as maize, cassava, sorghum, millet, sweet potatoes, beans, wheat and groundnuts will be targeted for increased production and productivity”. In some way, therefore, this strategy is actually to implement what already exists on paper coupled with the promotion of consumption of these diversified food crops for household food security. According to Ms. Chibuye, “The current status regarding the price of maize seems to suggest that Zambia is not moving forward in its agricultural development and strongly suggest failure to learn from historical experiences. For example, at the height of the same problem as recent as in the year 2005, the JCTR did make observations that touched on policy proposals as being mentioned above”. Based on previous and current experiences, it appears an approach to agriculture development that will not practically introduce food crop diversification at both the production and consumption level will mean continued transitory and chronic hunger among Zambian households. The current difficult of households’ meeting food needs is revealed by the JCTR Basic Needs Basket which measures cost of living for a family of six. According to the November JCTR Basic Needs Basket, average prices of mealie meal have increased in all towns where the Basic Needs Basket is conducted. A 25 kg bag of mealie meal in Ndola is currently fetching K65,800, an increase of K11,900 from K53,900 recorded in October 2008. The same bag costs K64,200 in Kitwe increasing from K56,700 in October. Luanshya recorded an increase of K6,100 from K56,600 in October to K62,700 in November. On average, the same bag costs K60,300 in Mongu, K57,300 in Lusaka, K57,200 in Livingstone and K56,200 in Kabwe. In Lusaka, the cost of food items alone increased by K19,500 from K686,350 in October to K705,850 in November 2008. The highest increase of food prices was recorded in Kitwe by K78,080 from K652,750 in October to K730,830 in November. This translates into a 12 percentage point increase of food prices alone within Kitwe town. Unprecedented increases have been recorded across all other towns with the price of mealie meal being a major contributing factor followed by dry fish. The overall cost of the Lusaka BNB, that is, taking into account cost of food and essential non-food items such as rentals, charcoal, wash and bath soap, amounted to K1,914,450. This figure represents an increase of K59,600 from the cost recorded in the month of October. This certainly makes it a challenge for households to meet their required household needs. In select rural areas where the JCTR does its Rural Basket, recent results have shown that most households have ran out of maize stocks. In seeking solutions to the current high prices of mealie meal, it is important that an optimal balance is found that will promote the interests of both rural and urban households. A lopsided approach might result in impairing growth of the small scale farmers or making food affordability difficult among urban populations. One of such measures would be to facilitate high production among small scale farmers while introducing community hammer mills in urban areas -- as has been recommended by other groups before -- to reduce on the overall cost of mealie meal. As the JCTR expresses happiness with Government establishment of the taskforce on Rising Food Prices, it will remain keen to learning what will come out of this taskforce. It is hoped that this taskforce will be the turning point in broadly improving Zambia’s agricultural practices and food consumption patterns.